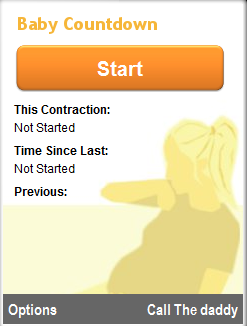 So today, I would like to introduce you to a Free Symbian Web Runtime App that helps you countdown the arrival of your baby. If you are pregnant in the UK and you are going into labour the hospital will ask you to monitor how frequent and long your contractions are before going in. However, I always thought that the last thing a expecting mum (and the dad for that matter) want to do is fire up excel as the contractions are kicking in. When you launch the Baby Countdown app, you are presented with a simple screen with on button that says: START. Once you press it, the counter starts keeping track of time. The button changes to STOP. As you can see from the snapshots below, the length of the current contraction is displayed under the title “This Contraction” as soon as STOP is pressed. Under the “Time Since Last:” title, the since the last contraction is displayed as soon as the next contraction has started and the START button is pressed. The other nice feature in this app is the speed-dial from the Right Soft Key. 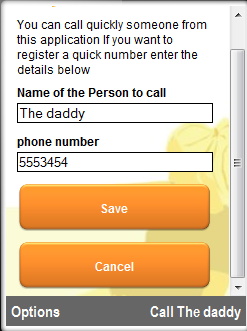 You can set your own number and label from the options menu. This app has been written with Nokia’s WRT for Symbian. I have tested it in a N97 mini and a N95. Hence spanning from S60 3rd edition to S60 5th/Symbian^1. This app should work also for other Symbian phones such as Nokia E71, Nokia 5800 and SonyEricsson Satio. please do fix it, my baby was due yesterday and I could really do with this app! thank you very much for fixing the link, I managed to d/l the app, unfortunately my phone insists that it’s an unsupported format. back to the drawing board. It looks like a very nice app!! I tried to download it for my Nokia 5800 but the link seems to be broken (http://ubuntuone.com/p/14Du/). Would you please please fix it!!! Or someone who already downloaded it before. Hi, I also tried to download it for my Nokia, but the link seems to be broken again (http://ubuntuone.com/p/14Du/). I would really appreciate it if you would be so kind to fix it. This app sounds absolutely great, but how do I install this app on my Satio?